You've found the “U.S. Tamworth Pig Breeders” page here at Hobby Farm Wisdom! If this is the first time you have visited our site: Welcome! The Tamworth pigs are a medium sized breed of domestic pigs native to the United Kingdom. Tamworths have an elongated head with a long, narrow body and erect ears. They come in a range of colors, from pale ginger to dark mahogany red. While their bristle hair typically protect it from the sun, during mulching extra shade is required to prevent sunburns. The breed is considered extremely adaptable to difficult climates and therefore popular in areas with harsh winters, such as Scotland and Canada. 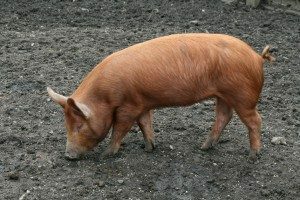 Tamworth pigs are excellent foragers and can graze successfully with cattle, although they can become territorial and aggressive towards other livestock. Tamworth pigs produce a muscular and firm ham.